WASHINGTON (CNN) -- The Obama administration is abandoning a controversial plan to charge private insurers for treatment of veterans' service-connected ailments. White House Chief of Staff Rahm Emanuel met with veterans' groups on Wednesday. In an statement Wednesday night, the White House said that although the president believes the plan would raise more money for veterans' care, the administration is dropping the idea after hearing the objections of veterans groups. "The President listened to concerns raised by the VSOs [veterans service organizations] that this might, under certain circumstances, affect veterans and their families' ability to access health care," the White House said. "Therefore, the president has instructed that its consideration be dropped." News of the change of heart originally came from Speaker of the House Nancy Pelosi, who disclosed the decision to reporters while meeting with a group of veterans on Capitol Hill. "President Obama has listened to the concerns expressed by veterans' leaders and veterans' service organizations," Pelosi said. "We will leave no veteran behind." Veterans' representatives and members of Congress have angrily opposed the proposal, which White House spokesman Robert Gibbs said was never finalized. Leaders from 11 veterans groups discussed their position in a meeting Wednesday afternoon with White House Chief of Staff Rahm Emanuel. "We stood firm on our stance that there is no way to support charging veterans' insurance companies for service-connected treatment," said Jim King, executive director of AMVETS, a leading veterans' advocacy organization. 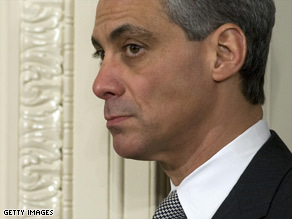 Emanuel indicated that the proposal was "a dead issue," King added. "The administration was quick to say [that if veterans were] going to fight it, [the White House wasn't] going to push it." Another attendee, Iraq and Afghanistan Veterans of America Executive Director Paul Rieckhoff, said Emanuel was quick to come back after hearing the veterans' groups stand firm and tell them, "Let's clarify, it is dead." "They made the right move -- they listened to us. Now we can move on to bigger more important issues," Rieckhoff said. The meeting was very short, said King. Despite the difference in opinion, King said the atmosphere was cordial and "everybody seemed comfortable." On Monday, the groups met with President Obama, Emanuel, Secretary of Veterans Affairs Eric Shinseki and Steven Kosiak, director in charge of defense spending for the Office of Management and Budget. The administration saw the plan as a way of raising more than $500 million in revenues for the Department of Veterans Affairs. However, veterans groups saw it is a violation of what they said is the government's moral obligation to treat veterans injured during service to their country. In addition, they believed it would lead to veterans and their families losing their private insurance or premiums rising because of the high costs of treating many service-related injuries. The head of the Senate Veterans Affairs committee, Daniel Akaka, D-Hawaii, said Tuesday his committee would "not advance any such legislation." His counterpart in the House, Bob Filner, D-California, said his committee wouldn't take up the proposal either. In a statement released by his office, Filner said the idea is "DOA" and said the budget "cannot be balanced on the backs (or legs, or kidneys, or hearts) of our nation's combat-wounded heroes." The president pushed back during the meeting on Monday, telling the groups that private insurance companies were getting a free ride. He challenged the veterans to come up with an alternative way to raise revenues. AMVETS planned to propose that billings be pursued more aggressively for injuries not related to service. But AMVETS director King said Emanuel didn't ask for suggestions in Wednesday's meeting. A 2008 Government Accountability Office study found that about $1.7 billion in treatment that could have been charged to private insurance never was, nor was it collected by the VA.